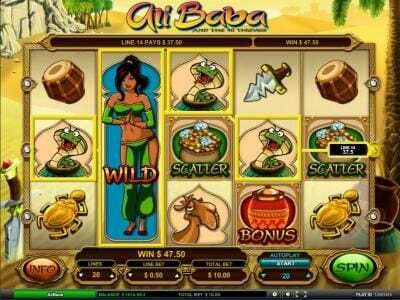 Ali Baba slot machine derived on the Middle Eastern theme with 20 lines and 5 reels from Leander software. 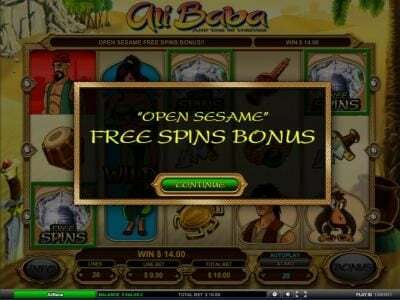 Ali Baba Slots has not been reviewed yet, be the first to rate this slot. 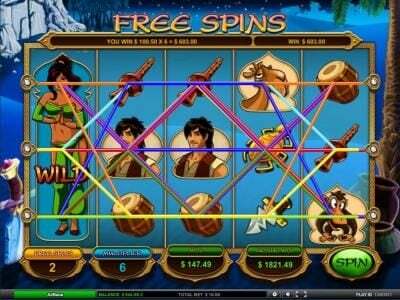 Ali Baba, a game from Leander, comes with 5 reels and 20 paylines. 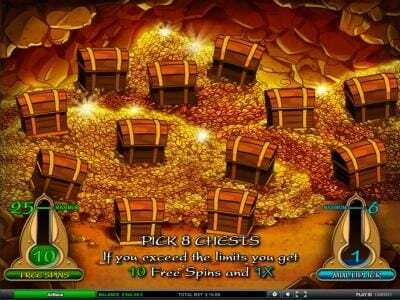 This game, which has a top jackpot of $25,000, also has as features wild symbols, scatters and Free Spins. The legend of Ali Baba and the 40 thieves is well known, and there has been quite a few other Slots created on this topic as well. Pretty much every story that involves some kind of treasures will make for a great slot theme, so that’s what Leander has done with this title, and they managed to get a decent looking game going on. The theme uses a lot of yellow, suggesting the desert, where the action takes place. You can see the desert in the background image, but the reels use a bit of sand like imagery as well. 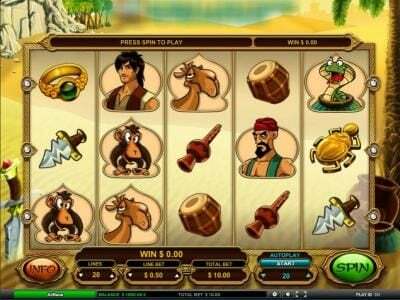 The symbols which you will find on the reels of this slot include Ali Baba, a belly dancer, a thief, the treasure, monkeys, camels, snakes, scarabs, rings, daggers, flutes and drums. The game allows for both the number of lines and the value of the coins to be chosen. There is only one coin used on each line, so the coin denomination is the line bet for the entire slot. You can choose a line wager which varies between $0.01 and $10, with 1 to 20 lines selectable. 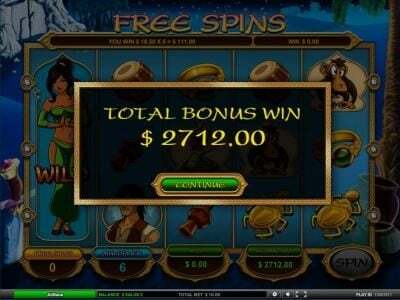 The result is a maximum wager of $200, while the 2500 coins top jackpot is worth up to $25,000. The belly dancer is the wild symbol in Ali Baba, and it’s a typical one, meaning that it substitutes for other symbols, with the usual exceptions being the symbols which have special roles, here represented by the scatter and the Bonus symbol. The wild does not have payouts of its own, and it will not multiply prizes in any way, so it’s as basic as they get. The other major feature of Ali Baba would be the scatter, which has the treasure symbol to represent it. Whenever the scatters appear on the screen, the thing that decides whether they pay their prize is the number of symbols of this type that are present. Because of their scatter ability, they don’t have to be on the same payline. If the player has three scatters, the payout is equivalent to five times the total bet of that round. With four scatters, the payout is 25 times the bet of the round. Finally, five scatters will have a prize of 100 times the total bet. 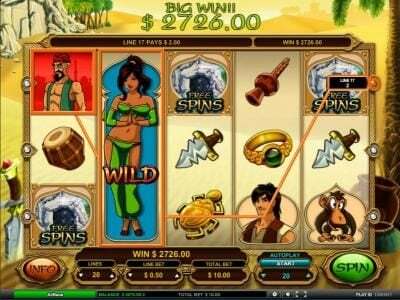 Ali Baba is a must play Slot if you’re looking for games where treasures are involved, and it has the usual array of options to help you increase your profits.